James Howard "Jim" Thome (; born August 27, 1970) is a retired American baseball player who played 22 seasons in Major League Baseball (MLB), from 1991 to 2012. He played for six different teams, most notably the Cleveland Indians during the 1990s and the Philadelphia Phillies in the early 2000s. A prolific power hitter, Thome hit 612 home runs during his career—the seventh most all time—along with 2,328 hits, 1,699 runs batted in (RBIs), and a .276 batting average. He was a member of five All-Star teams and won a Silver Slugger Award in 1996. Thome grew up in Peoria, Illinois, as part of a large blue-collar family of athletes, who predominantly played baseball and basketball. After attending Illinois Central College, he was drafted by the Indians in 1989 and made his major league debut in 1991. Early in his career, he played third base before eventually becoming a first baseman. With the Indians, Thome was part of a core of players that led the franchise to two World Series appearances in three years during the mid-1990s. He spent over a decade with Cleveland before leaving via free agency after the 2002 season to join the Philadelphia Phillies, with whom he spent the following three seasons. Traded to the Chicago White Sox before the 2006 season, Thome won the American League Comeback Player of the Year Award that year and reached the 500 home run club during his three-season tenure with the team. By this point in his career, back pain limited Thome to being a designated hitter. After stints with the Los Angeles Dodgers and Minnesota Twins, he made brief returns to Cleveland and Philadelphia before ending his career with the Baltimore Orioles. Upon retiring, Thome accepted an executive position with the White Sox. Throughout his career, Thome's strength was power hitting. In six different seasons, he hit more than 40 home runs, and in 2003, he led the National League in home runs with 47. His career on-base plus slugging (OPS) of .956 is 19th all time. In 2011, he became the eighth MLB player to hit 600 home runs. One of Thome's trademarks was his unique batting stance, in which he held the bat out with his right hand and pointed it at right field before the pitcher threw, something he first saw in The Natural. Thome was known for his consistently positive attitude and "gregarious" personality. An active philanthropist during his playing career, he was honored with two Marvin Miller Man of the Year Awards and a Lou Gehrig Memorial Award for his community involvement. 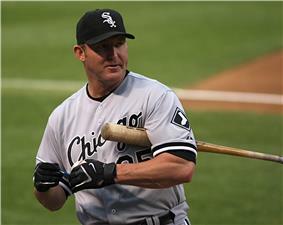 Thome was born in Peoria, Illinois, on August 27, 1970, the youngest of five children. Everyone within the blue-collar Thome family played sports: Jim's grandmother was hired at a local Caterpillar plant solely to play for the company's softball team; his father built bulldozers for Caterpillar and played slow-pitch softball; his aunt is a member of the Women's Softball Hall of Fame; and his two older brothers, Chuck III and Randy, played baseball at Limestone High School. Thome learned to play baseball from his father on a tennis court, and also played basketball in what he described as the "ghetto" of Peoria, noting that he was the only white kid there but that he earned the respect of his fellow players. One day during his youth, Thome sneaked into the Cubs' clubhouse at Wrigley Field in an unsuccessful attempt to obtain an autograph from his favorite player, Dave Kingman. Though Thome received signatures from several other players, this experience influenced him to be generous with signing autographs for fans during his playing career. Like his older brothers, Thome attended Limestone High School where he achieved all-state honors in basketball and as a baseball shortstop. Although he had hoped to draw the attention of scouts, at just 175 pounds (79 kg) he was relatively underweight for his 6-foot-2-inch (188 cm) height, meaning that he attracted only passing interest—the average Major League Baseball (MLB) player weighed 195 pounds (88 kg) in 1993. Thome graduated in 1988 and, after not being drafted, enrolled at Illinois Central College where he continued his baseball and basketball careers. After one season, he was drafted by MLB's Cleveland Indians as an "afterthought" in the 13th round of the 1989 MLB Draft. For the 1989 season, Thome was assigned to the Gulf Coast League Indians, a minor league affiliate of the Cleveland Indians. He finished the year with a .237 batting average, no home runs, and 22 runs batted in (RBIs). After his rookie season, he met "hitting guru" Charlie Manuel, who later became his manager and mentor. Unlike most Indians staff, Manuel saw potential in Thome and worked hard with him, particularly on his hip motion while swinging the bat. Thome later said, "[Manuel] saw something in me I didn't." During this work, Manuel suggested to Thome that he point his bat out to center field before the pitch to relax himself like Roy Hobbs did when batting in the baseball film The Natural. The work paid off; in 1990, Thome hit .340 and totaled 16 home runs and 50 RBIs playing at both the Rookie and Class A levels of the minor leagues. Thome spent most of the 1991 season splitting time between Double-A (Minor League Baseball) and Triple-A (Minor League Baseball) where, in combination, he hit .319 with 7 home runs and 73 RBIs. Thome made his MLB debut on September 4, 1991, as a third baseman against the Minnesota Twins. In the game, he recorded two hits in four at bats (2-for-4). He hit his first career home run on October 4. Injuries shortened his 1992 campaign, during which he played for both the Indians and their Triple-A affiliate, the Colorado Springs Sky Sox. Across the minor and major leagues that year, he combined to hit .236 with 4 home runs and 26 RBIs in 52 games. In 1993, playing mostly for the Charlotte Knights, the Indians' new Triple-A affiliate, he led the International League with a .332 batting average and 102 RBIs, complemented by 25 home runs. This performance earned him a late season promotion to the major league, where he hit .266 with 7 home runs and 22 RBIs in 47 games. After seven consecutive seasons with a losing record, "a new ballpark and a few offseason acquisitions coupled with rising young stars have made the Indians legitimate contenders" for the division title during their 1994 season. The Indians' core of offensive players included Carlos Baerga, Kenny Lofton, Sandy Alomar, Jr., Thome, and Eddie Murray. A "promising youngster", for the first time in his career, Thome spent the entire 1994 season with Cleveland, playing in 98 games while hitting .268 with 20 home runs and 52 RBIs. With help from the aforementioned core, the Indians held the wild card spot in the American League (AL) and were one game behind the Chicago White Sox in the standings for the AL Central Division lead before the 1994 players' strike forced cancellation of the season's remaining games. During the strike-shortened season, Thome had his first career multi-home run game, hitting two solo home runs on June 22, 1994, against Detroit Tigers' pitcher John Doherty. It was not until 1995 that the Indians' success led to a playoff berth. Thome was among the team's leaders at the plate, hitting .314 with 25 home runs and 73 RBIs, and the Indians finished with a 100–44 record to win the AL Central but lost the 1995 World Series to the Atlanta Braves in six games. Thome hit .211 in the World Series with one home run and two RBIs. Preceding the Indians' 1996 season, sportswriters predicted that Thome would be moved up in the batting order and bat in the sixth position (he had hit anywhere from the fifth to the eighth positions during his first two seasons). During the 1996 season, Thome hit 38 home runs, once hitting a 511-foot (156 m) homer at Cleveland's Jacobs Field, the longest home run ever at a Cleveland ballpark. Before their 1997 season, the Indians moved Thome, originally a third baseman, to first base after acquiring third baseman Matt Williams from the San Francisco Giants. That year, Thome helped the Indians set a new franchise single-season record for home runs (220), contributing 40 of them. Thome also totaled an AL-high 120 walks to go along with 102 RBIs. Cleveland returned to the World Series, but they lost to the Florida Marlins in seven games; Thome hit .286 with two home runs and four RBIs in the World Series. The next three seasons were not as successful as the previous three for either Thome or the Indians. In July 1998, Thome hit his 24th home run of that season while helping the Indians end the Yankees' 10-game winning streak. An article in Sports Illustrated published in July 1998 commented that despite Thome's early career success (two All-Star Games and appearances in two of the previous three World Series), he was only "faintly famous" nationally and was not particularly well-known outside of Cleveland or his hometown, Peoria. His former teammate Jeromy Burnitz said, "You can't really say he's underrated, because everybody considers him one of the top hitters in the American League, but he's surrounded by so many good players, it's hard to stand out on that team." In August, Thome broke a bone in his right hand and spent several weeks on the disabled list, missing 35 games. He finished the year with 30 home runs and 85 RBIs while posting a .293 batting average. In Game 3 of the AL Championship Series against the New York Yankees, he hit two home runs off Andy Pettitte en route to a 6–1 Cleveland victory. Cleveland subsequently lost the series to the Yankees. Headed into Cleveland's 1999 season, there were high hopes for the Indians; writers expected Thome to bat in the cleanup spot of the batting order. In May 1999, Thome hit a grand slam against Yankees pitcher Orlando Hernández, which helped Cleveland to a 7–1 victory. In total, his batting average fell to .277, but he increased both his home run and RBI totals to 33 and 108, respectively. In Game 1 of the AL Division Series, Thome hit a game-tying two-run home run off of Derek Lowe that sprung Cleveland's defeat of the Boston Red Sox by a score of 3–2. However, after leading two-games-to-none, Cleveland lost the five-game series. During the 2000 season, Thome hit .269 with 37 home runs and 106 RBIs. On June 21, he hit his 20th home run of the year against the Chicago White Sox, marking the seventh consecutive season in which he hit 20 or more home runs. 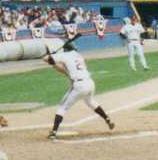 On September 29, while in the midst of a tight race for the AL Wild Card spot, Thome led the Indians to an 8–4 victory against the Toronto Blue Jays by hitting a two-run home run. After the game, Thome was quoted as saying, "This team has battled all year, so this was nothing new. Here we are, and we're here tomorrow to play another day." Despite finishing with a record of 90–72, the Indians missed the playoffs. For the 2001 Indians' season, he finished second in the AL with 49 home runs. In addition, Thome had 124 RBIs and 111 walks. However, he led the league with 185 strikeouts. He and Juan González, who totaled 140 RBIs, powered the Indians to another division title. Despite these numbers, the Indians could once again only reach the AL Division Series, where they lost in five games to the Seattle Mariners. Thome had his best season with Cleveland in 2002, leading the AL in walks (122), slugging percentage (.677) and on-base plus slugging (OPS) (1.122), while batting .304 (16th in AL) with a .445 on-base percentage (second in AL). He also hit a career-high 52 home runs (2nd in AL) and collected 118 RBIs (seventh in AL). The 52 home runs set a new Cleveland Indians' single-season record and made Thome the 21st major league player to join the 50 home run club. At the conclusion of the 2002 season, Thome, who was a free agent, rejected the Indians' "generous, long-term contract" offer (despite their offer to build a statue of him) to instead sign a six-year, $85 million contract with the Philadelphia Phillies – he thought the Phillies were closer to winning a championship than the Indians. With the Phillies, Thome's salary rose from $8 million per year to $11 million per year. Thome hit a franchise record 334 home runs in his first stint with the Indians. Thome hit 47 home runs in his first season with the Phillies, finishing one behind Mike Schmidt's single-season team record of 48 in 1980, and tied with Alex Rodriguez for the MLB lead in 2003. On June 14, 2004 at Citizens Bank Park, Thome hit his 400th career home run, surpassing Al Kaline for 37th on the all-time home run list. He ended the 2004 Phillies season with 42 home runs. In 2004, Thome won the Lou Gehrig Memorial Award, which is given to players who best exemplify Gehrig's character and integrity both on and off the field. Thome missed a significant portion of the first half of the Phillies' 2005 season due to injury; he compiled only a .207 batting average with 7 home runs and 30 RBIs going into the All-Star break. He was only sporadically effective; one result was that Phillies fans booed him and cheered for replacement Ryan Howard instead. He had season-ending surgery on his right elbow in August, while Howard won the NL Rookie of the Year Award. The Phillies traded Thome and cash considerations to the Chicago White Sox on November 25, 2005, for outfielder Aaron Rowand and minor league pitching prospects Gio Gonzalez and Daniel Haigwood. Though the emergence of Howard made Thome more expendable to the squad, another factor in his trade to the White Sox was his family situation – Thome's mother, the "go-to lady" in his family and his biggest fan, had died a year earlier, and he worried about his father. Since Philadelphia was willing to trade him, Thome waived the no-trade clause in his contract for the good of the team and requested that if possible, they trade him to Chicago so he could be with his father. Thome became Chicago's regular designated hitter in April 2006 and flourished in his first season in Chicago. He set the team record for most home runs in the month of April (10), overtaking Frank Thomas's previous record by one. He also set a major league record by scoring in each of Chicago's first 17 games. For the season, Thome hit 42 home runs, drove in 109 runs, and hit .288, though he struck out in 30% of his plate appearances, the highest percentage in the AL. On May 1, 2006, Thome returned to Cleveland to play against the Indians in his first game as a visitor at Jacobs Field, and received an unenthusiastic reception. On September 16, 2007, Thome joined the 500 home run club by hitting a walk-off home run against Los Angeles Angels pitcher Dustin Moseley. Thome became the 23rd major leaguer to reach the milestone and the third in the 2007 MLB season (the others were Frank Thomas and Alex Rodriguez), as well as the first ever to do it with a walk-off home run. Several family members including his father were on hand to witness the accomplishment, which occurred at a game during which the White Sox distributed free Thome bobbleheads to fans. Thome celebrated by pointing upward in homage to his late mother as he rounded the bases. On June 4, 2008, Thome hit a 464-foot (141 m) home run—which at the time was the ninth-longest home run in U.S. Cellular Field history—against Kansas City Royals pitcher Luke Hochevar in a 6–4 White Sox victory. He hit a solo home run in the AL Central Tiebreaker game, which proved to be the difference as the White Sox defeated the Minnesota Twins, 1–0. Thome's hitting remained strong during Chicago's 2009 season – he hit his 550th career home run. On July 17, 2009, he hit a grand slam and a three-run home run for a single-game career-high seven RBIs. By the conclusion of the season, he had passed Reggie Jackson for 11th place on the all-time home run list with 564 home runs. On August 31, 2009, the White Sox traded Thome to the Los Angeles Dodgers along with financial considerations for minor league infielder Justin Fuller. Thome waived his no-trade clause because he thought the Dodgers could win the World Series, something he had never done during his career, but Thome's only appearances with the Dodgers were as a pinch hitter. An additional reason for Thome to come to Los Angeles was the opportunity to reunite with former Cleveland teammates Manny Ramirez and Casey Blake. He hit .235 with no home runs and three RBIs while with the Dodgers (4-for-17). After the season, Thome filed for free agency, eventually signing with the Minnesota Twins. 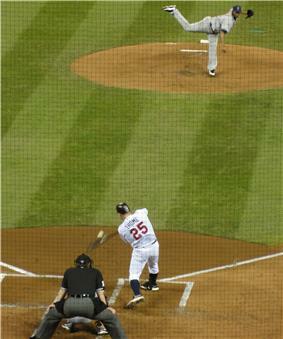 Thome hit his first home run with the Twins on April 8, during the Twins' season-opening road trip. The Twins opened Target Field, their new home stadium, on April 12, 2010. This was the third time in Thome's career that his team had opened a new stadium – the 1994 Cleveland Indians when they opened Jacobs Field, and the 2004 Philadelphia Phillies when they opened Citizens Bank Park. On July 3, Thome hit two home runs, passing fellow Twin Harmon Killebrew for tenth on the all-time home run list. The game was stopped and the Twins played a pre-recorded message from Killebrew congratulating Thome on the accomplishment, during which Killebrew noted he was happy Thome did it while a member of the Twins. Thome hit the first walk-off hit in Target Field on August 17, a 445-foot two-run home run in the bottom of the 10th inning against the White Sox. It was the 12th walk-off home run of his career, tying him for the most all time (a record he subsequently broke). On September 4, Thome again hit two home runs in a single game to tie and then pass Mark McGwire for the ninth spot on the career home run list. Thome surpassed Frank Robinson's home run total on September 11, when he hit his 587th career home run in the top of the 12th inning in Cleveland. Toward the end of the season, Thome commented that playing with the Twins made him feel rejuvenated. He finished the 2010 season with a .283 average, 25 home runs and 59 RBIs. Thome posted his best slugging percentage since 2002. In January 2011, Thome accepted a one-year, $3 million contract with incentives to continue playing for the Twins. On July 17, Thome hit the longest home run ever at Target Field, a 490-foot (150 m) home run into the upper deck in right-center field. He hit his 599th and 600th career home runs (in two straight at bats) at Comerica Park in Detroit on August 15, making him only the eighth player to achieve that home run total. On August 26, 2011, Thome waived his contractual no-trade clause to return to his first team, the Cleveland Indians, in exchange for future considerations for the Twins. On September 18, the clubs announced that Minnesota had received $20,000 for him, which Aaron Gleeman of NBC Sports called "silly" and "nothing"; Paul Hoynes of The Plain Dealer wrote that ticket and jersey sales alone from re-acquiring Thome covered the money they paid to acquire him. On September 23, Cleveland held a ceremony to honor Thome, and revealed plans to erect a statue depicting him in Heritage Park. In the game, he hit a home run that landed near the proposed location for his statue. While with Cleveland in 2011, Thome played in 22 games, predominantly hitting fifth in the batting order, and he posted a .296 batting average with 3 home runs and 10 RBIs. Through 2011, he was second among all active major leaguers in career home runs (604; behind Alex Rodriguez) and RBIs (1,674; Rodriguez), and fifth in career slugging percentage (.556; behind Albert Pujols, Rodriguez, Ryan Braun, and Howard). Thome was the Indians' all-time leader in home runs (337), walks (1,008), and strikeouts (1,400). After the 2011 season, Thome agreed to a one-year, $1.25 million deal that returned him to Philadelphia. He called coming back to Philadelphia a "no-brainer" in his news conference. He also mentioned that, due to Ryan Howard's Achilles tendon injury, he would "spend the offseason preparing himself to play first base once or twice a week", despite not having played defensively since 2007. 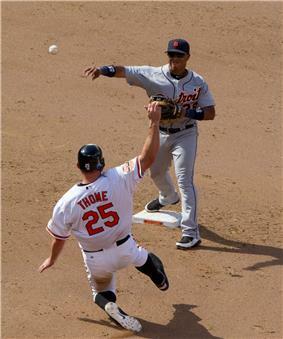 Thome started his first game at first base since 2007 on April 8, 2012, during which he started a 3–6–3 double play. Thome experienced stiffness in his lower back in the Phillies' game against the Chicago Cubs on April 28, and early in May, he was placed on the 15-day disabled list with a strained lower back. At the time, he was batting only .100. Thome returned to the club in early June, and prepared for interleague play against the Baltimore Orioles as the DH. Thome finished the nine-game interleague road trip with four home runs and 14 RBIs. On June 17, Thome became the fourth major league player to hit 100 home runs with three different teams, joining Reggie Jackson, Darrell Evans and Rodriguez. Six days later, Thome hit a pinch-hit walk-off home run in the ninth inning off of Jake McGee to beat the Tampa Bay Rays, 7–6. This was Thome's 609th home run, tying Sammy Sosa for seventh all-time in home runs while also setting the new record for most walk-off home runs (13) in the modern era. Thome's last game as a Phillie was an afternoon loss to the Miami Marlins on June 30. After the game (which coincided with Howard's return from the disabled list), the team announced that Thome had been traded to Baltimore to serve as their designated hitter. "I think you look at him and say: This is a guy who loves the game more than anyone. He's the first guy to the park, the first guy to the weight room, the first guy hitting." On July 20, Thome hit his first home run with the Orioles, his 610th of all time moving him past Sosa for seventh place all-time, against the Indians at Progressive Field. On August 6, Thome was placed on the 15-day disabled list with a herniated disk; he remained on the DL until September 21. In his first game back, he drove in the game-winning RBI in extra innings against the Boston Red Sox. After beating the Indians in a game where he hit his 611th career home run, Thome said, "There's a lot [of] memories. I've had great memories on that side and then coming in here as an opponent against them. Any time you come home, they say, it's very special. It's even more special to get the W's. That's, I think, the main thing. The bottom line is I played here a long time." Orioles teammates remarked at Thome's commitment to talking about the game while in the dugout. Thome remarked, "I talk the game. When I set in the dugout during games I talk baseball to these guys. They'll ask, 'Hey, what's this pitcher like?' or 'What about the game?' 'What about all those Indians teams you were on?' I did it to Eddie Murray when he was in his 40s." The Orioles made the playoffs, but lost in five games to the Yankees during the AL Division Series. Thome hit .133 in the playoffs with no home runs or RBIs. On July 2, 2013, Thome joined the White Sox organization as special assistant to the general manager. In the future, Thome aspires to be a manager, an aspiration that White Sox chairman Jerry Reinsdorf wholeheartedly supports; Reinsdorf commented, "He can be a batting coach. He'd be a great batting coach, but someday he'll be a manager." In March 2014, Thome clarified that he is not officially retired; while he "loves" his front office job with the White Sox, he would "have to take" a call about him playing again. However, on August 2, 2014, he signed a one-day contract with the Cleveland Indians to retire officially as a member of the team. Thome is regarded as a great example of a "pure" power hitter, as indicated by his .278 Isolated Power (ISO) rating. Thome's consistency was a draw for clubs to continue to sign him, even toward the very end of his 22-year career and after most sluggers' productivity fades. In 2011, he was ranked the sixth-best designated hitter in MLB history by Fox Sports. During his career, he compiled a .284 batting average against fastballs but compiled just a .170 batting average against sliders. Since Thome was a pull hitter, opposing teams often employed a defensive shift against him; by playing three infielders on the right side of the field and the outfielders towards his pull side, teams put themselves in better position to field batted balls. In 2011, Lindy's Sports described him as an "extremely patient veteran slugger who launches cripple fastballs and breaking-ball mistakes to all fields", though they did note that he struck out frequently, had poor speed, and should serve only as a designated hitter. During his career, he had strong power numbers; in 15 of his 22 seasons, he had a slugging percentage of over .500. He is an example of a "three-true-outcome" player; 47.6% of his career plate appearances resulted in either home runs, strikeouts, or walks, the highest of all time by nearly seven percentage points. He is a self-described slow runner, but has said that he always hustled. He stole only 19 bases after 1994. Thome began his career playing third base and did so until the 1997 season, when he converted to first base to make room at third after the Indians traded for Williams. Injuries, however, took their toll and confined him almost exclusively to being a designated hitter in the latter stages of his career. Overall, he spent 10 separate stints on the disabled list, mostly for his back. By the end of Thome's career, his back prevented him from playing the field effectively – he played first base four times with the Phillies in 2012 which marked the first time he played the field since 2007 with the White Sox. By the end of his career, writers described him as being a "huge liability in the field". "Eddie taught me to play the game exactly the same when you fail and when you succeed. Hit a home run, hey, enjoy the moment, but then let it go. If you strike out with the bases loaded, same thing, let it go. I don't smash helmets when I strike out, because it's not the helmet's fault, it's my fault." "It's not just the numbers. Thanks to his gregarious personality, Thome is the rare athlete who played in several cities and was beloved everywhere he went. I saw the Twins and Phillies play each other in Philadelphia when Thome was with the Twins, and the same two teams in Minnesota two years later when Thome was a Phillie, and the opposing crowd cheered Thome both times, even when he hit home runs for the road team. Thome was similarly loved in his long stints in Cleveland and Chicago, as well as shorter runs in Los Angeles and Baltimore." A fan poll in The Plain Dealer in 2003 named him the most popular athlete in Cleveland sports history. Despite his injuries throughout his later years, Thome totaled, according to Fangraphs, 71.6 Wins Above Replacement (WAR), a sabermetrics baseball statistic intended to quantify a player's total contributions to a team. He was one of few players whose prime was during the steroid era and was not suspected of using steroids; Thome adamantly denies ever using performance-enhancing drugs. Soon after the announcement of his front office position (which signified the end of his playing career), writers began to speculate as to whether or not Thome would make it to the Baseball Hall of Fame, and more specifically, whether he would gain entrance in his first year of eligibility in 2018. Writers also questioned whether Thome's candidacy would be hindered by his lack of self-promotion and others' tendency to overlook him. ^ a b c Verducci, Tom (August 16, 2011). "Thome reaches 600 with humility, grace and country power". ^ a b c d Pluto, Terry (October 1, 1996). "Thome shows power of Peoria Indian: Third baseman's rural roots are apparent in his blue-collar work ethic and his ability to hit the ball a country mile". ^ a b c d e f g h Bamberger, Michael (July 13, 1998). "The Pride of Peoria". ^ Lee, Christopher (March 26, 2010). "Major League Baseball (MLB) Player Height and Weight". Sportsologist. Retrieved January 15, 2014. ^ Rogers, Phil (April 19, 2006). "Jim Thome can't stop touching all the bases". ^ Sickels, John (January 21, 2011). "Jim Thome Career Profile". Minor League Ball - SBNation.com. Vox Media. Retrieved September 20, 2012. ^ Lentz, Scott (January 29, 2013). "Is 2013 the Last Hoorah for Charlie Manuel in Philadelphia". Yahoo! Sports. Retrieved March 28, 2014. ^ Lawrence, Ryan (January 15, 2014). "Report: Charlie Manuel rejoining Phillies". The Philadelphia Daily News. Retrieved March 28, 2014. ^ Posnanski, Joe (September 27, 2010). "He's 40, but Jim Thome's mind isn't on retirement - Page Three". SI Vault (Time). Archived from the original on January 16, 2014. Retrieved April 11, 2013. ^ "Jim Thome Minor League Statistics & History". Baseball Reference. Retrieved March 7, 2014. ^ "September 4, 1991 Cleveland Indians at Minnesota Twins box score and play by play". Baseball Reference. Retrieved April 13, 2014. ^ a b c d e "Jim Thome Statistics and History". Baseball Reference. Retrieved October 29, 2012. ^ a b c "Jim Thome career home runs". Baseball Reference. Retrieved April 13, 2014. ^ a b c Kazzie, David (April 6, 1994). "After 40 years of futility, Tribe will dance to new drum". The Cavalier Daily. Retrieved December 2, 2012. ^ The Baseball Chronicle. Lincolnwood, Illinois: Publications International, Ltd. 2002. pp. 592, 600, 616, 622, 650, 656. ^ a b "Box Score of game played on Wednesday, June 22, 1994 at Tiger Stadium". Baseball Almanac Box Scores. Baseball-Almanac. Retrieved April 1, 2013. ^ a b "1995 Cleveland Indians Batting, Pitching, & Fielding Statistics". Baseball Reference. Retrieved April 16, 2014. ^ Ringolsby, Tracy (March 31, 1996). "American League Central Preview". ^ "Box Score of game played on Sunday, July 16, 1995 at Jacobs Field". Baseball Almanac Box Scores. Baseball-Almanac. Retrieved April 1, 2013. ^ a b "The Ballplayers – Jim Thome". BaseballLibrary.com. Retrieved July 8, 2009. ^ Ringolsby, Tracy (November 16, 1997). "Marlins, Reds begin cleaning house". ^ Housenick, Mandy (October 28, 2009). "Potent Phillies, Yankees bats, homer-friendly parks could mean crowd-pleasing slugfest". ^ "Thome, Wright spark Indians by Yankees". Lewiston Morning Tribune. ^ "Cleveland Loses Thome In Victory at Tampa Bay". ^ a b Pearlman, Jeff (March 23, 1999). "1999 Sports Illustrated Baseball Preview - Cleveland Indians". Sports Illustrated. Archived from the original on July 25, 2008. Retrieved April 9, 2013. ^ "Indians club Yanks, take 2–1 series lead". ^ a b "Indians Postseason Results". indians.com: History. MLB. Retrieved January 16, 2014. ^ "CNN/SI AL Recap (Cleveland-NY Yankees)". CNN/SI. May 31, 1999. Archived from the original on January 16, 2014. Retrieved October 29, 2012. ^ "Indians break playoff jinx; injury sidelines Martinez". The Post and Courier (Charleston). Associated Press. October 7, 1999. p. 2C. Retrieved October 29, 2012. ^ "MLB Scoreboard: Recap". CNN/SI. June 22, 2000. Archived from the original on January 16, 2014. Retrieved October 29, 2012. ^ Withers, Tom (September 30, 2000). "Indians clinging to hope". ^ "Indians Year-By-Year Results". indians.com: History. MLB. Retrieved February 21, 2013. ^ "Top 25 Home Runs in 2001 in the American League". Baseball Almanac. Retrieved April 18, 2014. ^ "Juan Gonzalez Stats". ESPN. Retrieved April 18, 2014. ^ "2001 League Division Series – Seattle Mariners over Cleveland Indians (3–2)". Baseball Reference. Retrieved October 29, 2012. ^ "2002 American League Batting Leaders". Baseball Reference. Retrieved January 16, 2014. ^ Bryant, Howard (2006). Juicing the Game: Drugs, Power, and the Fight for the Soul of the Major League. New York: Penguin. p. 136. ^ "Sources: Phillies, Thome agree to six-year deal". CNNSI.com - Baseball (Time). Associated Press. December 3, 2002. Archived from the original on May 11, 2008. Retrieved January 16, 2014. ^ a b c Crasnick, Jerry (August 26, 2011). "Minnesota Twins trade Jim Thome to Cleveland Indians". ^ "Top 50 free agents". ESPN.com. Retrieved September 4, 2008. ^ Kimball, Bob (August 26, 2011). "Cleveland Indians reacquire Jim Thome". ^ "2003 MLB Team and Player Stats". Major League Baseball - ESPN. Retrieved April 16, 2014. ^ Miller, Stephen (August 26, 2006). "Wolf, Howard help Phillies hold off Mets". The Morning Call (Allentown, PA). Retrieved April 18, 2014. ^ "Baseball Roundup; Thome Hits 400th Home Run of Career". ^ White, Paul (August 10, 2005). "Questions about honesty, lefties and public personas". ^ a b Chen, Albert (August 1, 2005). "First Priority". Sports Illustrated 103 (4). Archived from the original on February 1, 2014. Retrieved November 2, 2012. ^ a b "White Sox send Rowand to Phils for Thome". ESPN.com. November 25, 2005. Retrieved July 8, 2009. ^ Associated Press (November 7, 2005). "Street wins AL Rookie of Year; Howard wins NL". MLB - ESPN. Retrieved February 21, 2013. ^ Zolecki, Todd (April 4, 2005). "A piece of the rock: Jim Thome's mother was his family's foundation. He's building on that.". ^ Stark, Jayson (August 16, 2011). "Jim Thome a truly real and caring person". ESPN.com. Retrieved November 1, 2012. ^ Associated Press (April 29, 2006). "Contreras masterful again as White Sox slip past Halos". ESPN. Retrieved April 16, 2014. ^ Associated Press (April 23, 2006). "Uribe powers ChiSox past Twins for eighth straight win". ESPN. Retrieved April 16, 2014. ^ "Major League Leaderboards – 2006 – Batters – Advanced Statistics". FanGraphs. Retrieved September 12, 2012. ^ Merkin, Scott (May 2, 2006). "Thome, Sox silence Cleveland critics". MLB.com. Retrieved November 1, 2012. ^ a b "For the Record". Sports Illustrated 107 (12): 22. September 24, 2007. Archived from the original on March 25, 2014. Retrieved March 25, 2014. ^ "Thome reaches 500 HR milestone in walk-off fashion". ESPN. September 16, 2007. Retrieved April 18, 2014. ^ Merkin, Scott (September 16, 2007). "Thome family shares in joy of No. 500". whitesox.com. MLB. Retrieved April 29, 2013. ^ Gyr, Alex (September 16, 2007). "Thome's quest for 500 ends with win". whitesox.com. MLB. Retrieved April 29, 2013. ^ Gregor, Scot (June 6, 2008). "How far did Thome's HR fly?". ^ "September 30, 2008 Minnesota Twins at Chicago White Sox Play by Play and Box Score". Baseball Reference. Retrieved July 8, 2009. ^ Gano, Rick (June 5, 2008). "White Sox beat Royals in 15 on Konerko homer". Yahoo! Sports. Retrieved June 6, 2008. ^ "Jim Thome's 7 RBIs lead Chicago White Sox past Baltimore Orioles, 12-8". ^ Eymer, Rick (August 15, 2009). "Thome matches Reggie on all-time list". MLB.com. Retrieved November 1, 2012. ^ "Chicago White Sox deal Jim Thome, Jose Contreras at deadline". ESPN Chicago. September 1, 2009. Retrieved November 1, 2012. ^ Rogers, Phil (September 2, 2009). "Jim Thome shows once again why he's a throwback player". ^ Ely, David (September 2, 2009). "Pinch-hitting role suits Thome fine in LA". MLB.com. Retrieved September 4, 2009. ^ Levy, Mike (September 1, 2009). "Ex-Cleveland Indians sluggers Jim Thome and Manny Ramirez re-unite on Los Angeles Dodgers". ^ Pete Palmer, ed. (2010). Who's Who In Baseball 2010 (95th ed.). New York: Who's Who in Baseball Magazine Co. pp. 171–172. ^ "Twins defeat Red Sox in first game at outdoor Target Field". ESPN. April 12, 2010. Retrieved April 12, 2014. ^ Berman, Chris (April 4, 1994). Video: Indians win Jacobs Field opener. Cleveland, Ohio: MLB. ^ "Progressive Field History" (PDF). indians.com. MLB. 2009. Retrieved April 20, 2014. ^ Shenk, Larry (April 3, 2014). "Citizens Bank Park 'firsts' through history". phillies.com. Retrieved April 20, 2014. ^ Hartman, Sid (July 3, 2010). "Thome humbled to pass Killebrew". ^ Kay, Joe (August 16, 2011). "Thome hits 600th home run". Baseball - NewsObserver.com. McClatchy Newspapers. Retrieved November 2, 2012. ^ "Jim Thome passes Harmon Killebrew for 10th place on HR list". MLB News. Fox Sports Interactive Media, LLC. July 3, 2010. Retrieved November 29, 2012. ^ "Twins stretch AL Central lead to 4 thanks to Jim Thome homer in 10th". ESPN. August 17, 2010. Retrieved April 13, 2014. ^ Abnos, Alexander (June 25, 2012). "Jim Thome hits 13th walk-off home run, an MLB record". SI Wire. Time. Retrieved April 18, 2014. ^ "Jim Thome passes Mark McGwire for 9th on HR list in Twins' victory". ESPN. September 4, 2010. Retrieved April 13, 2014. ^ "September 11, 2010 Minnesota Twins at Cleveland Indians Play by Play and Box Score". Baseball Reference. September 11, 2010. Retrieved September 14, 2011. ^ Posnanski, Joe (September 27, 2010). "He's 40, but Jim Thome's mind isn't on retirement - Page Five". SI Vault (Time). Archived from the original on January 17, 2014. Retrieved April 11, 2013. ^ Thesier, Kelly (August 18, 2010). "Thome's blast ups Twins' lead to four games". MLB.com: News. Retrieved November 1, 2012. ^ Jim Thome's 2002 Stats Retrosheet Accessed November 1, 2012. ^ "Jim Thome gets 1-year deal from Twins". ESPN. January 14, 2011. Retrieved April 13, 2014. ^ Schelling, Jordan (July 17, 2011). "Jim Thome's mammoth blast, No. 596, lifts the Twins over Royals". MLB.com: News. Retrieved November 2, 2012. ^ Bollinger, Rhett (August 16, 2011). "Thome becomes eighth to hit 600 homers". MLB.com: News. Retrieved April 16, 2014. ^ Bastian, Jordan (August 25, 2011). "Thome waives no-trade, returns to Indians". MLB.com: News. Retrieved November 1, 2012. ^ AP (August 26, 2011). "Minnesota Twins trade Jim Thome to Cleveland Indians". ESPN.com. Retrieved November 1, 2012. ^ Gleeman, Aaron (September 19, 2011). "Twins get $20,000 from Indians to complete Jim Thome deal". NBC Sports. HardballTalk. Retrieved April 16, 2014. ^ Hoynes, Paul (September 18, 2011). "Tribe sends $20K to Twins to complete Thome deal". The Plain Dealer (Cleveland, Ohio). Retrieved March 28, 2014. ^ Bastian, Jordan (September 24, 2011). "Thome's night ends with Santana's walk-off homer". MLB.com. MLB Advanced Media. Retrieved November 6, 2011. ^ "Ryan Howard Statistics and History". Baseball Reference. Retrieved October 15, 2011. ^ "Indians All-Time Leaders". indians.com: History. MLB. Retrieved October 20, 2012. ^ "Phillies sign Thome to 1-year deal". ^ Zolecki, Todd (November 5, 2011). "Jim Thome ready to pinch-hit, play for Phillies". phillies.com: News. Retrieved March 12, 2013. ^ Zolecki, Todd (November 5, 2011). "Jim Thome back with Phillies on one-year deal". MLB.com News. Retrieved April 16, 2014. ^ Associated Press (April 8, 2012). "Philadelphia Phillies vs. Pittsburgh Pirates - Recap - April 08, 2012". ESPN. ESPN Internet Ventures. Retrieved April 29, 2013. ^ Brookover, Bob (May 1, 2012). "Jim Thome struggling as pinch-hitter". The Philadelphia Inquirer. Retrieved May 1, 2012. ^ Associated Press (June 6, 2012). "Philadelphia Phillies activate Jim Thome from disabled list, option Pete Orr to Triple-A". ESPN. Retrieved April 18, 2014. ^ Housenick, Mandy (June 16, 2012). "With Interleague soon over, will Jim Thome be just a pinch hitter for the Phillies?". ^ Zolecki, Todd (June 29, 2012). "Phillies could trade Thome to AL team soon". phillies.com: News. MLB. Retrieved February 20, 2013. ^ "Colby Rasmus 3 for 4 with homer, 3 RBIs as Blue Jays cap sweep". ESPN. June 17, 2012. Retrieved April 13, 2014. ^ Kaplan, Jake (June 23, 2012). "Thome's walk-off caps day of Phils milestones". MLB.com. Retrieved 2012-06-24. ^ Luca, Greg (June 30, 2012). "Orioles trade for Jim Thome from Phillies". MLB.com: News. Retrieved February 20, 2013. 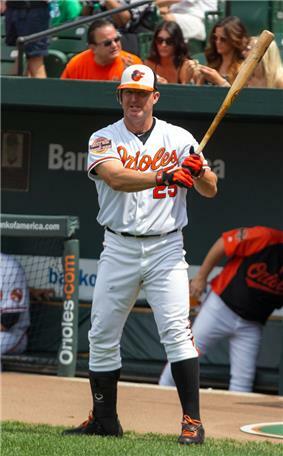 ^ "Baltimore Orioles acquire Philadelphia Phillies' slugger Jim Thome". ESPN. July 1, 2012. Retrieved November 28, 2012. ^ Connolly, Dan (June 30, 2012). "Orioles close to closing deal for Jim Thome". The Baltimore Sun. Retrieved November 28, 2012. ^ a b Carpenter, Les (July 17, 2012). "Jim Thome, he of 600 home runs, loves baseball so much it's infectious to his Orioles teammates". Yahoo! Sports. Retrieved July 18, 2012. ^ "Jim Thome hits home run No. 610, seventh all-time". The Seattle Times. Associated Press. July 20, 2012. Retrieved November 29, 2012. ^ Ghrioli, Brittany (August 6, 2012). "Thome out until September with herniated disc". orioles.com: News. MLB. Retrieved November 29, 2012. ^ Ulman, Howard (September 22, 2012). "Orioles Beat Red Sox: Jim Thome lifts Baltimore to 16th straight win in extra innings". Sporting News on AOL (TheHuffingtonPost.com). Retrieved November 29, 2012. ^ "Indians lose to old friend Jim Thome". ^ "Jim Thome Statistics and History". Baseball Reference. Retrieved November 29, 2012. ^ Gonzales, Mark (July 2, 2013). "Chicago White Sox Jim Thome special assistant". ^ Van Schouwen, Daryl (February 23, 2014). "White Sox' Jim Thome wants to manage in future". ^ Heyman, Jon (March 5, 2014). "Thome loves front office job but if someone offers playing job, well ...". CBS Sports. Eye on Baseball. Retrieved April 3, 2014. ^ Snyder, Matt (August 2, 2014). "Jim Thome officially retires as an Indian with one-day contract". CBS Sports. Retrieved August 2, 2014. ^ Gaines, Cork (May 23, 2012). "The 20 Greatest Power Hitters of All-Time". Business Insider. Retrieved February 25, 2013. ^ a b Gleeman, Aaron (February 22, 2013). "Jim Thome is looking for work". HardballTalk. NBC Sports. Retrieved February 25, 2013. ^ "Best designated hitters ever". FOX Sports. October 10, 2011. Retrieved March 5, 2013. ^ "Jim Thome Scouting Report". Inside Edge - ESPN. Retrieved March 5, 2013. (subscription required (help)). ^ Greenberg, Jon (May 6, 2006). "Notes: Shift doesn't bother Thome". MLB.com: News. Retrieved March 5, 2013. ^ Bollinger, Rhett (April 5, 2011). "Defensive shift a new challenge for Mauer". twinsbaseball.com: News. MLB. Retrieved March 5, 2013. ^ O'Neill, Shane, ed. (February 2011). "Lindy's Sports Baseball 2011 Preview". Birmingham, Alabama: J. Lindy Davis Jr. p. 176. ^ a b Posnanski, Joe (September 27, 2010). "He's 40, but Jim Thome's mind isn't on retirement - Page Four". SI Vault (Time). Archived from the original on January 17, 2014. Retrieved April 11, 2013. ^ "Career Stolen Bases - Jim Thome". Sportometry. Tangraph Technologies. Retrieved April 11, 2013. ^ Gonzales, Mark (September 14, 2007). "Moving day was a blessing: Thome's switch from 3rd base to 1st jump-started career". ^ Whiteside, Larry (March 1, 1997). "Indians hope Williams will be bellwether - They're counting on ex-Giant for punch". ^ Palmer, Pete, ed. (2012). Who's Who In Baseball. New York: Who's Who in Baseball Magazine Co. p. 175. ^ "Thome, Orioles win 16th straight in extra innings". Boston News, Weather, Sports - FOX 25 - MyFoxBoston. Fox Television Stations. September 22, 2012. Retrieved February 25, 2013. ^ Associated Press (June 6, 2012). "Philadelphia Phillies activate Jim Thome from disabled list, option Pete Orr to Triple-A". ESPN. Retrieved February 25, 2013. ^ Vetrone Jr., Bob (June 21, 2012). "Our Jim Thome Plan". ^ "Jim Thome Fielding Statistics and History". Baseball Reference. Retrieved March 3, 2013. ^ "Jason Giambi, Andy Pettitte among members of age 40 club that are still making impact in majors". NESN.com. New England Sports Network. Retrieved April 9, 2013. ^ Meisel, Zack (August 26, 2011). "Indians welcome Jim Thome back by emulating his high socks". indians.com: News. MLB. Retrieved March 30, 2013. ^ a b Ryness, Gar; Dewart, Caleb (2010). Batting Stance Guy: A Love Letter to Baseball. Simon & Schuster. pp. 32, 217. ^ Kepner, Tyler (August 20, 2011). "Thome's success rooted in a simple suggestion". The New York Times Baseball Blog. Retrieved March 30, 2013. ^ "SI.com – MLB – SI Players Poll: Friendliest/Unfriendliest MLB Player?". Sports Illustrated. May 16, 2007. Archived from the original on July 24, 2012. Retrieved 2012-04-05. ^ a b Kurkjian, Tim (August 17, 2011). "Jim Thome as genuine as they come". ^ Snyder, Matt (November 4, 2011). "Jim Thome signs with Phillies". CBS Sports. Retrieved March 30, 2013. ^ Posnanski, Joe (September 27, 2010). "He's 40, but Jim Thome's mind isn't on retirement - Page Two". SI Vault (Time). Archived from the original on January 16, 2014. Retrieved April 11, 2013. ^ Silver, Stephen (January 16, 2013). "Jim Thome's faltering case for the Hall of Fame". Philadelphia Magazine. The Philly Post - News. Retrieved January 15, 2014. ^ Arcand, Tim (June 30, 2010). "Gentleman Jim Thome set to make history as a Minnesota Twin". Bleacher Report. Turner Broadcasting System. Retrieved December 2, 2012. ^ "Jim Thome - Statistics - Batting". FanGraphs Baseball. Stats LLC. Retrieved March 14, 2013. ^ Shea, John (August 14, 2011). "Jim Thome has clean reputation amid steroid era". ^ Couch, Greg (August 16, 2011). "In an era of cheats, Thome is a player worth believing in". SportingNews.com. MLB. Retrieved March 14, 2013. ^ Reynolds, Dave (November 23, 2013). "Hall of Fame voters eager for Jim Thome ballot". ^ Peick, Sean (June 24, 2012). "Jim Thome's tremendous numbers likely won't be enough to get him into the Hall of Fame on first ballot". New England Sports Network. MLB. Retrieved January 21, 2014. ^ Wessler, Kirk (November 23, 2013). "Why doesn't anyone talk about Jim Thome?". Journal Star (Peoria, IL). Retrieved January 21, 2014. ^ Silver, Stephen (January 16, 2013). "Jim Thome's faltering case for the Hall of Fame". ^ Brown, David (December 12, 2007). "Sox entertain kids at holiday party". MLB.com. Retrieved December 9, 2012. ^ "Jim Thome: Postseason Players". MLB.com. Retrieved December 2, 2012. ^ "Thome's shot trumps McGwire's slam". ^ Hunter, Justin (July 1, 2012). "The Unappreciated Career of Jim Thome". Call to the Pen. Fansided. Retrieved November 28, 2013. ^ Merkin, Scott (November 27, 2013). "Jim Thome donates $100,000 to help with tornado relief". phillies.com: News. MLB. Retrieved November 28, 2013. ^ a b Hageman, William (September 15, 2013). "Andrea Thome on why she volunteers". Chicago Tribune. Retrieved April 6, 2014. ^ Just, David (January 13, 2008). "Thome hosts annual charity event". whitesox.com: News. MLB. Retrieved April 6, 2014.